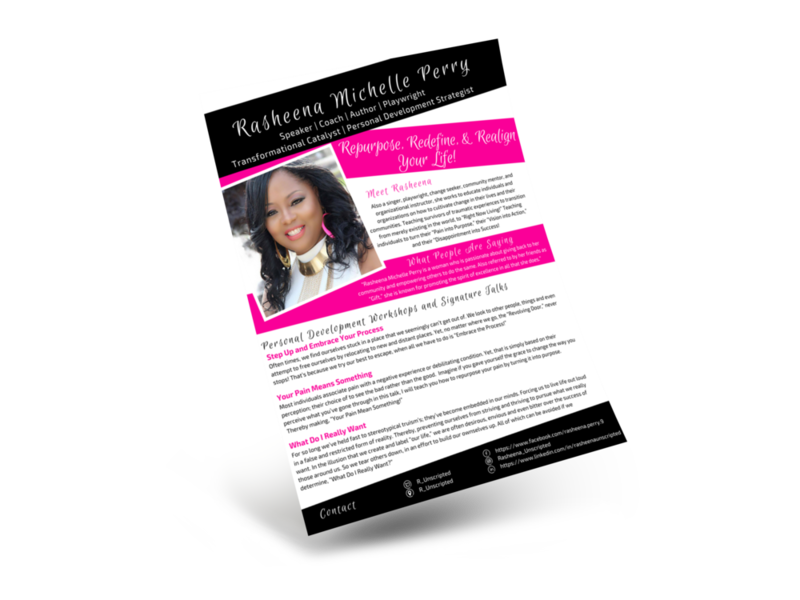 Your speaker one sheet is often times your first impression and formal introduction to event organizers. Why not have one that speaks well on your behalf? 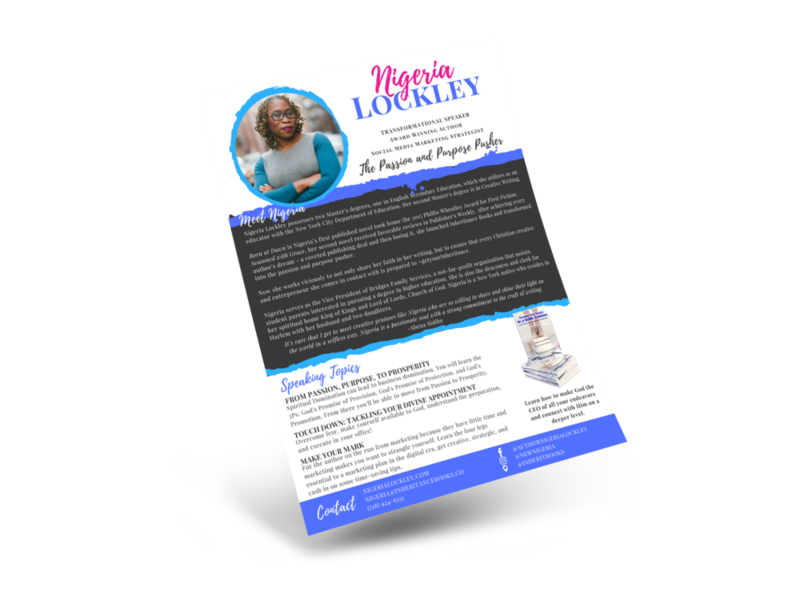 You desire and deserve unique speaker promo graphics to set you apart. You are clear on or ready to become clear on the components of your visual brand such as colors, fonts, etc. You want to make speaking engagements an big part of your income mix. You are ready to invest in presenting yourself as a professional speaker. Let's announce to the world you are open for speaking engagements! Q1. WHAT'S THE DIFFEENCE BETWEEN THE SPEAKER ONE SHEET AND SPEAKER KIT? The Speaker ONE Sheet is designed to be just that, a ONE sheet or summary of the info in your Speaker Kit. 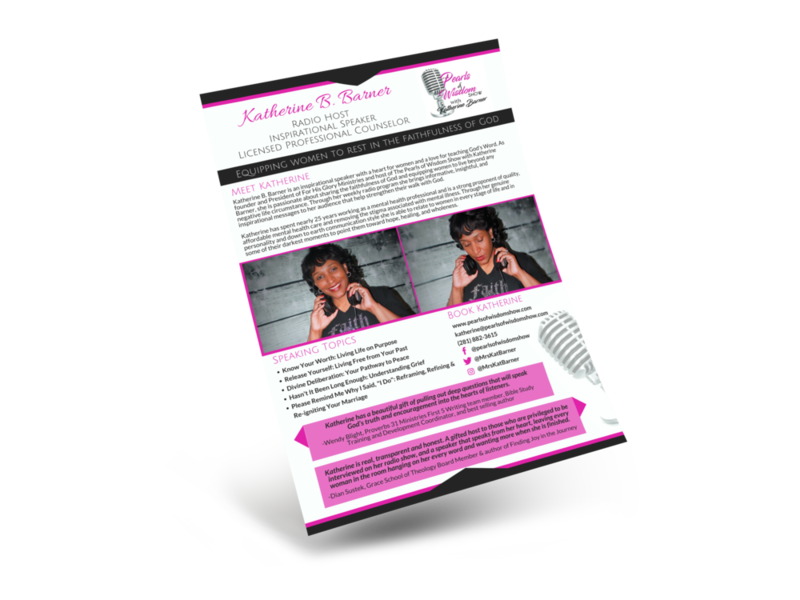 The Speaker Kit is a multipage document which includes your bio (short and long), images of you at past events, testimonials, your related books and products, etc. 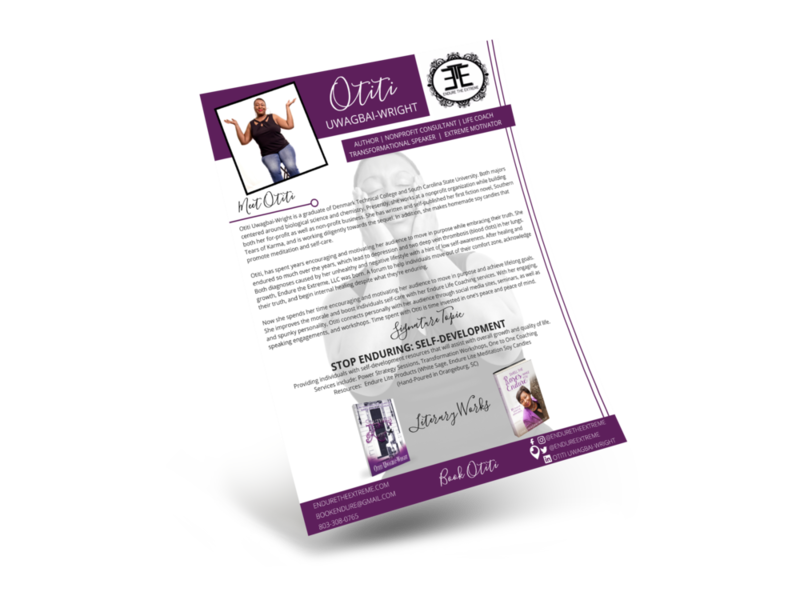 The online version of the Speaker Kit gives event organizers and media professionals a convenient place to download your one sheet, bio, headshots and more. Q2. WHAT CAN I DO WITH A "NOW ACCEPTING BOOKINGS" SOCIAL SHARE GRAPHIC? This is a square graphic that is easily shareable in places like Facebook, Instagram, and Twitter which announces that who you are, your speaking topics, and that you are currently accepting invitations to speak. Q3. WHAT IS A "SPEAKER REQUEST eFORM" ? This is an online form that can be included on your web page or shared separately (via a link) that allows event organizers to send you an invitation to speak. This nice thing, is that they are required to fill in certain event details so you can see if you are interested in the opportunity BEFORE getting on a call with them! Q4. WHAT DO I NEED TO SUBMIT FOR THE SPEAKER REEL VIDEO ? Your logo, 5 to 10 professional high quality photos (of you speaking or posed), and video clips of you speaking. If none of those are available, stock photos/videos will be selected for you. You are welcome to choose from our musical selection or submit your own as long as it is copyright free. Q5. DO I NEED A WEBSITE TO GET THE SPEAKER KIT WEB PAGE? You can have the speaker kit web page added to your current website if you have one. If you do not have a website we can create your speaker kit web page on Squarespace (monthly Squarespace fee is client's responsibility). The cool thing is, the site can later be expanded into a full site as your business grows! Q6. DO YOU OFFER PAYMENT PLANS? The Ultimate Speaker's Package Investment can be split into two equal payments for your convenience. You may request this in your preDesign consulation. Q7. IM READY! HOW DO I GET STARTED? Excellente! (in my best latina voice lol) Just hit the "Schedule a Consult" button above and let's get this party started!